”Time to market” - a critical success factor for Schibsted. Learn how Schibsted, with Sweden’s largest consumer database, thought about choosing and implementing its integration platform. Create faster time-to-market for new services and enable innovation through integration. The media world is changing at an accelerating pace and to have a quick ”time to market” is a critical success factor. The need to be able to easily replace and introduce new IT services is constantly increasing. 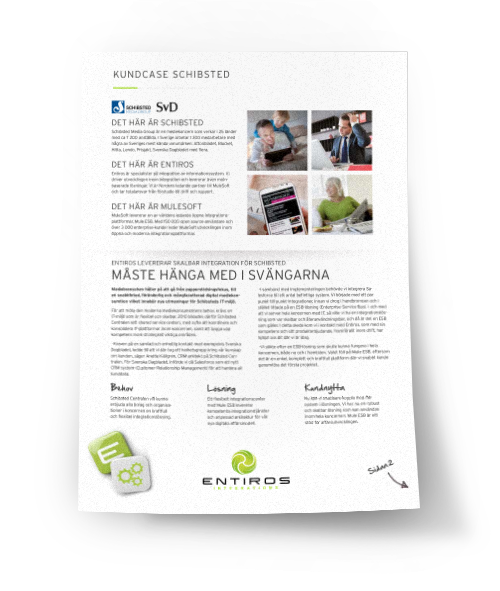 Read about the collaboration between Schibsted and Entiros and how the right-chosen integration platform creates faster onboarding of new companies and faster time-to-market for new services.